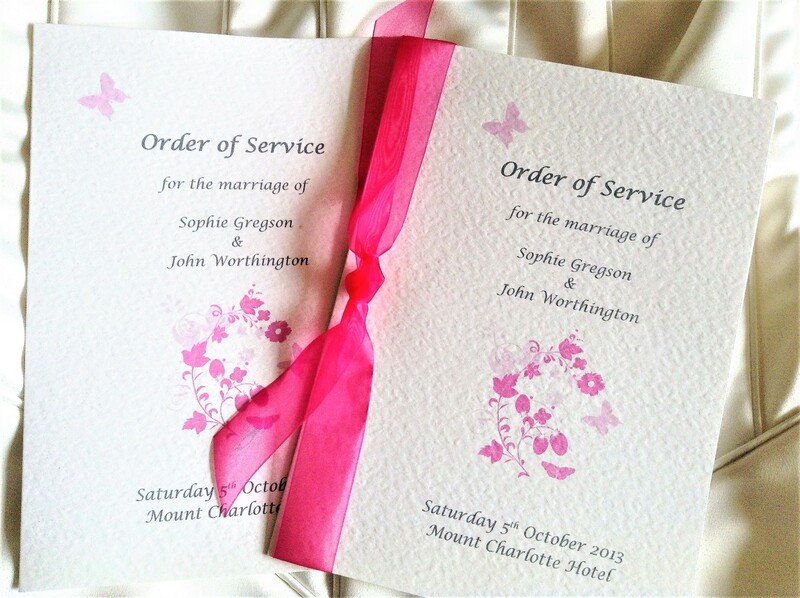 A5 Pink Butterfly Wedding order of service books can be purchased with or without paper inserts. We supply order of service books for Catholic and Church of England Weddings and Civil Ceremonies. Our books are printed with all personalised details regarding the wedding ceremony including hymns, readings and prayers for church weddings. For civil ceremonies we can include the timings throughout your day, ie. Pre ceremony drinks, ceremony, photographs, wedding breakfast, cutting the cake, evening reception and carriages. A civil ceremony usually includes musical interludes, readings, poems, exchange of the rings and declaration of vows. Some couples also like to include details of their wedding party, name of best man, bridesmaids, flower girls, ushers and bride and grooms parents etc. We include the bride and groom’s names, date of wedding and church/venue details on the front cover. Alternatively to the designs shown we can include a favourite photograph of the bride and groom or the church/venue itself. 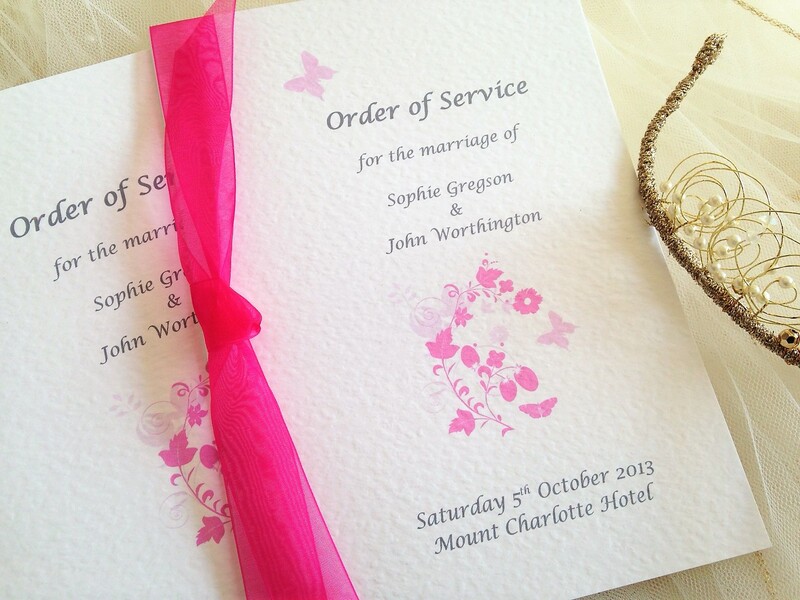 Order of service books can be finished with a luxurious ribbon in satin or organza to match your colour scheme. If you prefer we can supply the card covers for you to add your own paper inserts. We provide proofs for approval by email which you may wish to check with your church or registrar before we print your order of service books. 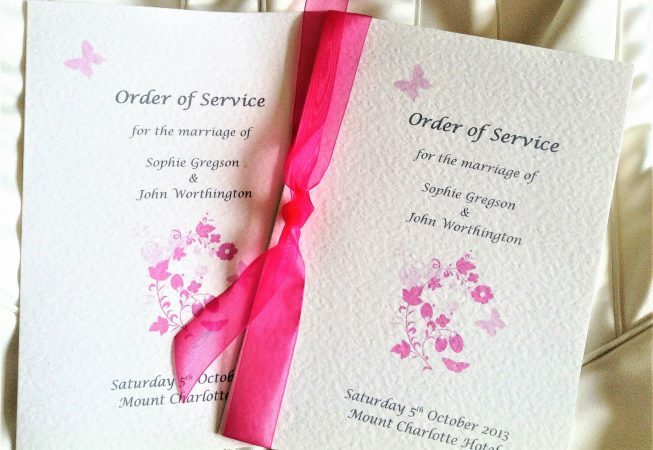 Pink Butterfly Wedding Order of Service Books also make a lovely memento of the day, as guests like to take them home. 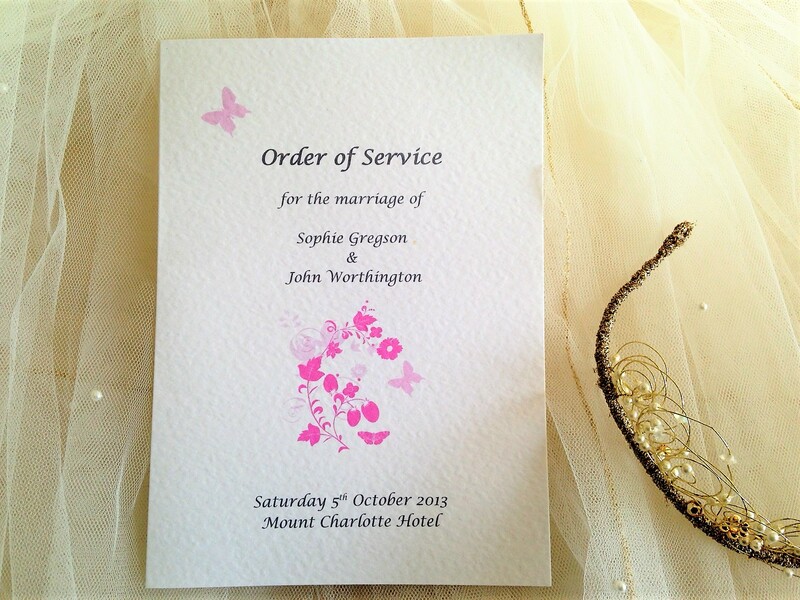 Part of our Pink Butterfly Wedding Stationery Range. Minimum order quantity is 20. We have short lead times, our printing is done in house. 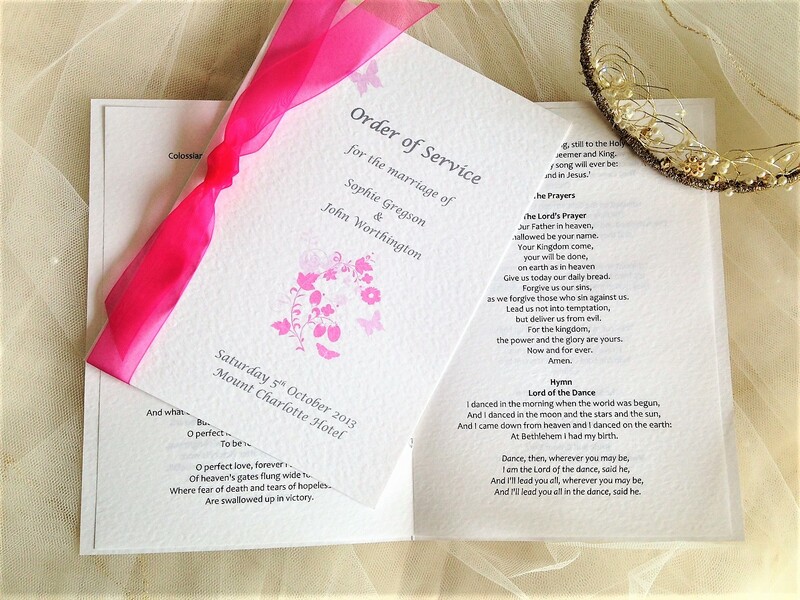 Order of service books can be ordered and supplied within a short timescale, usually 3-4 days for quick delivery in the UK. Prices are per book, minimum order quantity is 20 books. Printed on a quality thick heavy hammered card (270gsm) in white or ivory. Paper inserts are on 100gsm hammered textured paper to match the outer card cover.